Raise your hand if you love Ethiopian food! We’ve got both hands enthusiastically stretched to the sky! 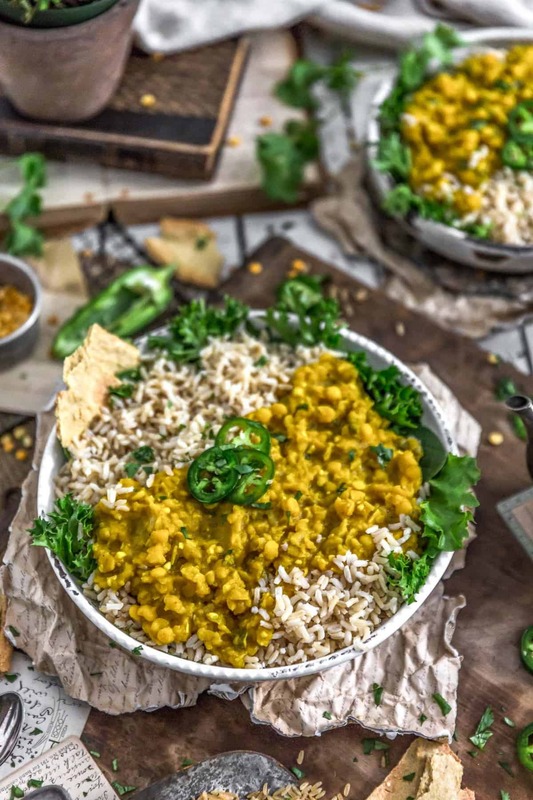 Creamy, cozy, and bursting with flavor, this Ethiopian Yellow Split Pea Stew (Kik Alicha) is packed with hearty, healthy, and satisfying goodness that is sure to make dinner a happy place of comforting deliciousness. Simple and inexpensive come together stew is perfect for ladling over injera, rice, potatoes, and more! A tasty dish that is sure to have the family running back for seconds. This blog post is dedicated to my brother, Chris. 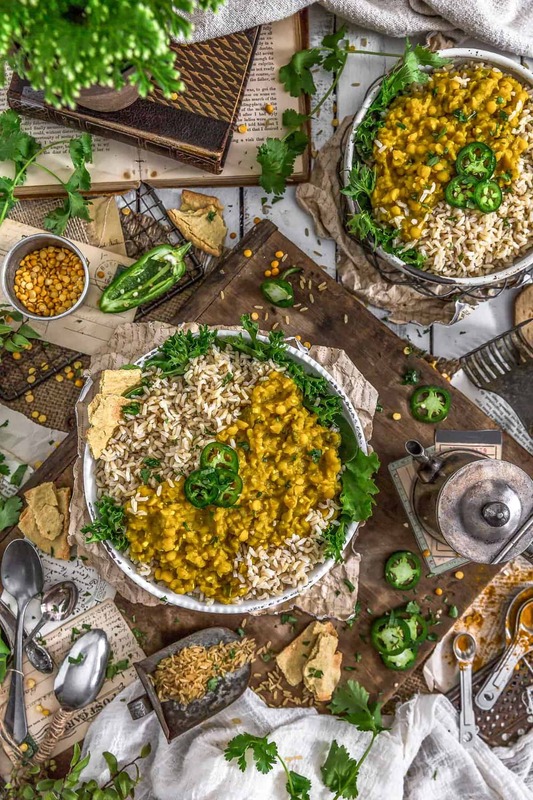 As most of our Readers know by now, my brother is a Celiac and his all-time favorite cuisine is Ethiopian food as it is naturally gluten free. He LOVES it, so does Katie and Charlotte! I adore Ethiopian food as well, and so does Mom, although Mom took a little longer to love it. She is one of those people who need to taste a new dish several times before it hits her taste buds just right. Dad enjoys it, but not as much as we do. There is an Ethiopian restaurant in Stamford, CT called “Teff”. They have the most amazing Ethiopian food …. EVA!!! I love all their dishes and their injera (bread) is to die for. So good! Every time we visit Chris, Katie, and Charlotte in CT, we have to order take-out from Teff. It is a must! It wouldn’t be a visit without it. As our Readers know, we live in Canton, Ohio. 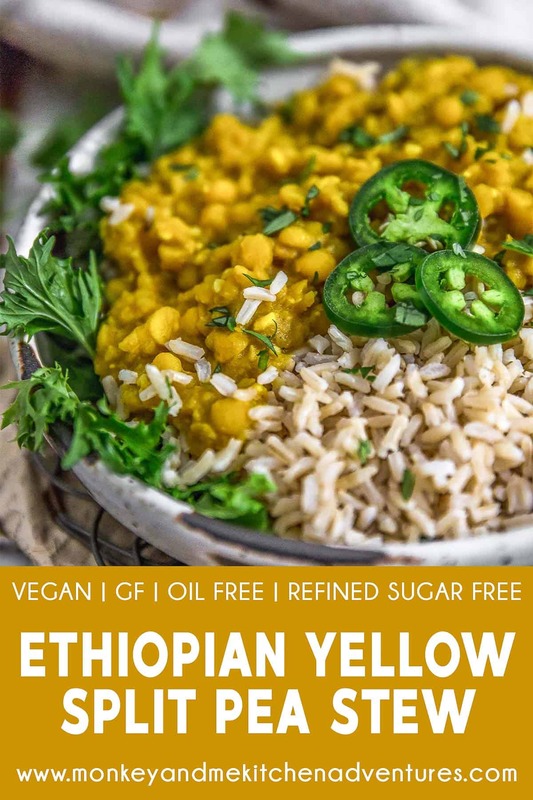 Sadly, there are no Ethiopian restaurants nearby, well, in all honesty, there are simply NO Whole Food Plant Based restaurants in Ohio, period. At least none that I am aware of. If you know if any, PLEASE, let us know! You can kinda get some make-shift WFPB dinners, if you personally call the chef of a restaurant ahead of time to see if he/she can finagle something for you, but we rarely do that. We simply don’t eat out at restaurants, except once in a blue moon for social gatherings. How about you? Any WFPB restaurants in your town? This dish is one of my favorites! 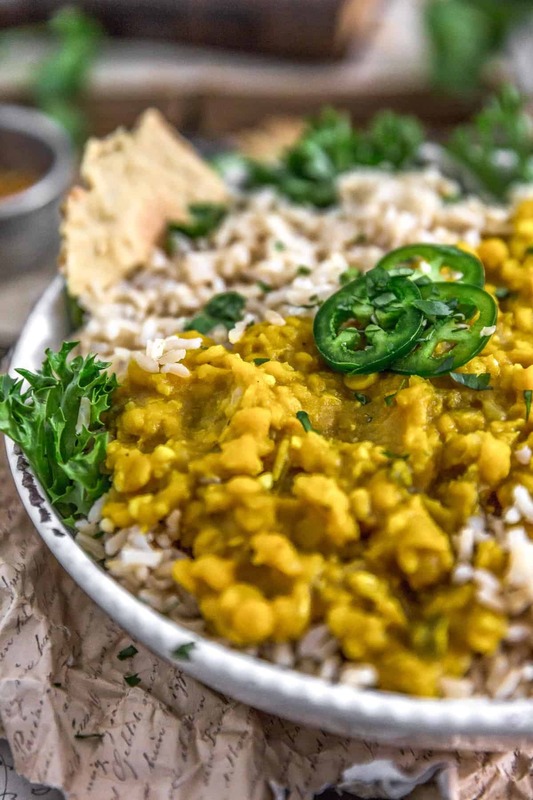 I love Kik Alicha, those yummy yellow split peas make for a beautiful dish. If you have never had Ethiopian food, this is a great dish to start on as the flavors are more mellow than their traditional dishes. I think the hardest part of this dish is getting all the split peas soft within a reasonable amount of time. We tried making this using an Instant Pot, but it simply didn’t work out very well for us. Perhaps you will have greater success than we do. We simply couldn’t get the timing right, no matter how hard we tried. 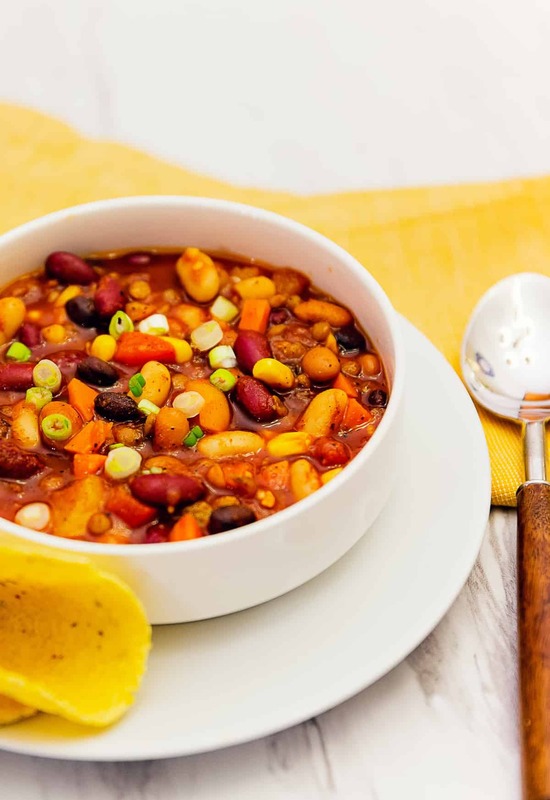 If you try this dish using an Instant Pot and are happy with the outcome, we would love to know. I’ll let Mom tell you more! Monkey is right, the first time I tried Ethiopian food, I thought it was OK, but I am one of those people that really needs to experience new and different foods several times. Then for some weird reason, after trying it several times (I don’t like to give up), the food will just click with me, and I will love it. There aren’t too many foods that I don’t like. I pretty much like everything. Every time we visit Chris, Katie, and Charlotte, we order take-out from Teff. They have this beautiful “tasting” menu which offers you a wide variety of all different types of dishes, so you get this yummy smorgasbord of Ethiopian food. It is quite lovely. I thoroughly enjoy it. 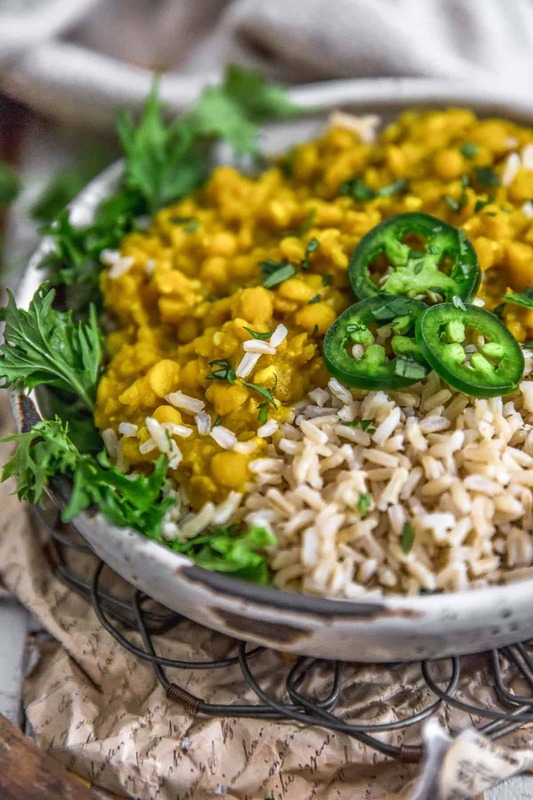 Yellow Split Peas do take a little longer to get soft, so you want to build in that time. You don’t have to do anything but wait. LOL We recommend soaking the yellow split peas overnight to give them a head start. 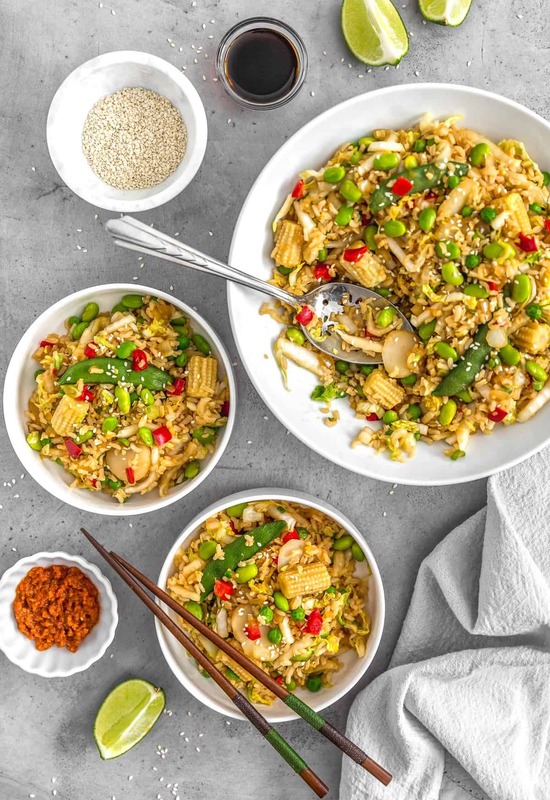 I am sure cooking them in an Instant Pot would significantly reduce the time, but our efforts simply didn’t pan out, and we tried it a number of times, so we finally landed on cooking this dish on the stove top to get the texture and flavor just right. Don’t let the time investment deter you from creating this delicious dish. We hope you give this deliciousness a try! We just know you are going to love it! Give this recipe a try! We would love to hear from you! Please leave us a review. Review the Notes section to determine your options on cooking yellow split peas: Overnight soak, quick method, or stovetop cooking. In a large ceramic/enamel lined Dutch oven/pot or similarly large stockpot, add the finely diced onion and jalapeno peppers. Sauté over medium-high heat for 5 to 7 minutes until the onions and peppers are tender. (If needed to prevent sticking, add a splash of vegetable broth or water). Add the minced garlic and ginger and sauté for 30 seconds. Then add the spices: onion powder, garlic powder, dried minced onion flakes, turmeric, coriander, cumin, black pepper, and sea salt; sauté for 30 seconds to one minute to release the spice fragrance. Add the water, vegetable broth, and split yellow peas, bring to a boil, then immediately lower to a simmer. Place a tight-fitting lid on the pot and simmer for 1 hour and 15 minutes. After 1 hour and 15 minutes, remove the lid and cook for another 15 minutes, then check the to see if the yellow split peas are tender. This time can vary greatly largely dependent upon which cooking/presoaking of the yellow split peas was taken. Anywhere from 1 ½ hours to 2 hours, see cooking yellow split peas in the notes section. Once the yellow split peas are tender, remove about one cup of split peas, mash, then return to the pot. Taste the stew, adjust spices as needed (see notes section on spices). This thickens the stew into a heartier texture. 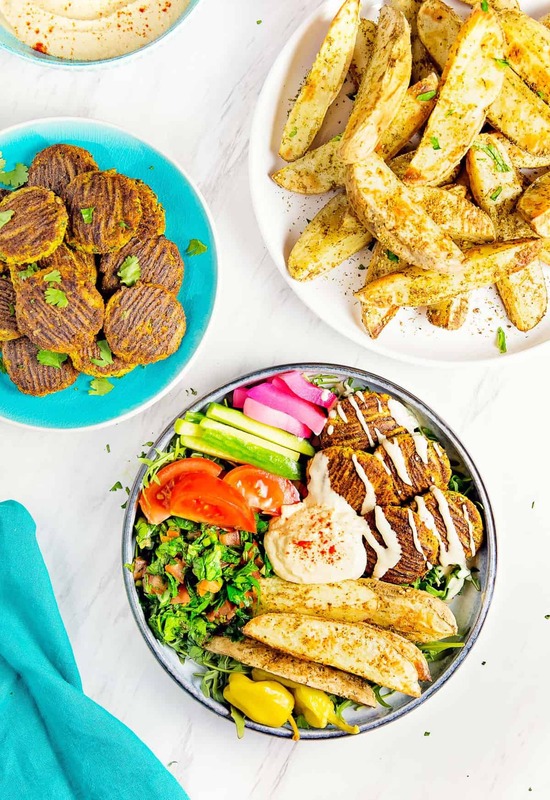 Serve over your favorite rice or potatoes or with your favorite flatbread or pita. 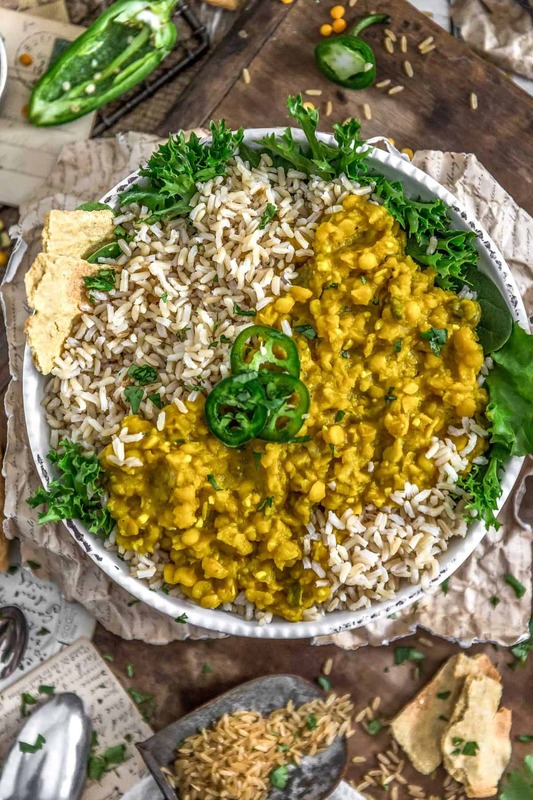 *Cooking Time for Yellow Split Peas: Yellow split peas do not require soaking; however, you can cut down the cooking time of the yellow split peas if you presoak them overnight as they can take up to well over an hour and up to two hours to cook. To soak them overnight, simply place the cleaned and rinsed split peas into a bowl and cover generously with water and allow to sit overnight in the refrigerator. 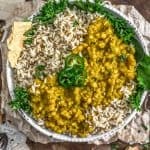 OR you can also follow a quick method which is to place the yellow split peas in a pot, cover them with water (at least 3 inches), bring to a boil, boil for 2 minutes, cover with a lid, remove from the stove and allow to sit for one hour undisturbed. We strongly recommend pre-soaking of the yellow split peas overnight in the refrigerator. 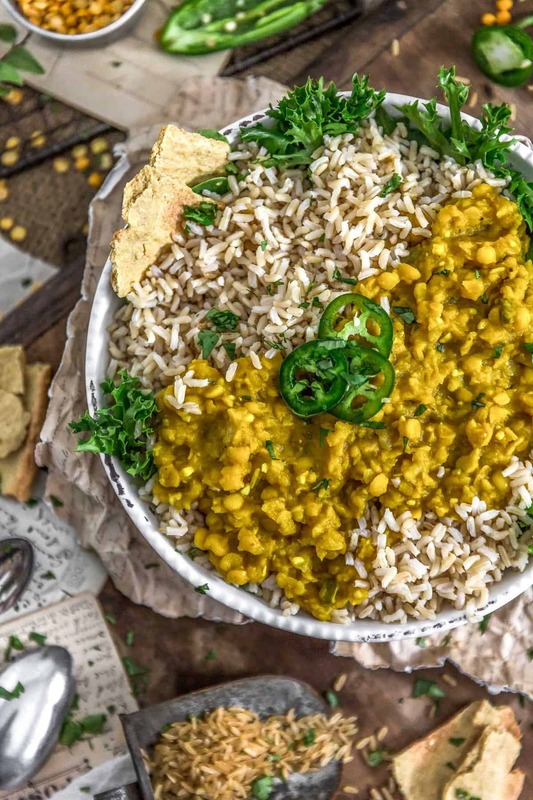 Keep in mind that there are other factors that influence the cooking time such as the age of the yellow split peas, older yellow split peas take longer to cook as they tend to become drier and harder as they age. *Vegetable Stock: We use Pacific Organic Low Sodium Vegetable Stock. We love this brand because it is Whole Food Plant Based compliant, as it does not contain MSG, has no oil, and does not contain any highly-processed ingredients; however, this brand of vegetable stock does have a strong flavor so less broth is required when compared to the water ratio. We use a higher water to broth ratio because of this. If you are using a brand other than Pacific vegetable broth, then consider adjusting the water/vegetable broth ratio accordingly. For example, if you are using a very mellow vegetable broth, you might consider 3 ½ cups of vegetable broth and ½ cup of water for this recipe. Please adjust the recipe (broth/water ratio) accordingly based upon the vegetable broth brand used if using other than Pacific Organic Vegetable Stock. *Spice Blend: Some spices tend to mellow over a long cooking process. The longer you cook them the more they tend to neutralize. What may appear to be a perfect blend of seasoning early on, could mellow out over time, ramp up any spices as needed toward the end of the cooking process. If using an Instant Pot, you can add more spices and use the sauté mode to cook them for the additional time. Just stay with them and stir occasionally. 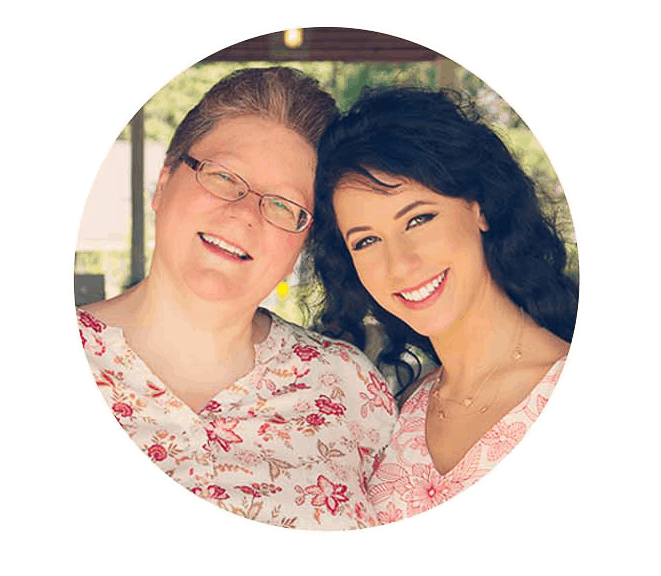 *Instant Pot: We get a lot of questions on Instant Pot. We tried both the stove top method, and using an Instant Pot. We preferred the stove top method simply because we had more control over the texture of the split yellow peas. We used the sauté function for the onions and jalapeno peppers for 7 minutes, then added the garlic and ginger for 30 seconds, then added the spices for 30 seconds to release their fragrance, then added all the remaining ingredients (reduce the water to 1 cup), stir well, then set the manual pressure high for 11 minutes, then waited 20 minutes and did a natural release. Again, it was difficult to get the texture of the yellow split peas consistent (some were still hard, some were completely soft). It was very frustrating. *Storage: Refrigerate and use within 5 days. Freezes well. I’ve been wanting to explore different recipes and this seems like the perfect one to start with! Thank you! Yaaay, so excited for you to get started on your WFPB journey. Hope you enjoy this dish as much as we do! Happy Cooking! Cleveland has an incredible Ethiopian restaurant….if you’re ever in the area, it’s a must-do!